Encouragement and inspiration from across faith traditions for walking with sorrow and honoring loss. 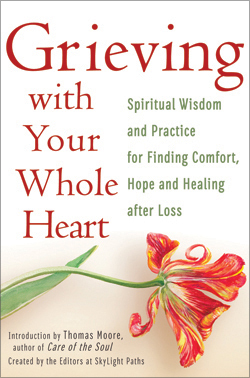 This soulful companion for grief offers wisdom and creative spiritual practices for expressing and experiencing sorrow while keeping a life-giving connection to the past. Whether you need to grieve in words or silence, in solitude or in company with others, this compassionate guidance from across spiritual traditions will meet you where you are, helping you find wholeness and a renewed vision of yourself and the world. For use by individuals as well as in groups or counseling settings. Swami Adiswarananda, former senior monk of the Ramakrishna Order of India, was minister and spiritual leader of the Ramakrishna-Vivekananda Center of New York and annotator of Tagore: The Mystic Poets (SkyLight Paths). Peter Bankson has been a popular preacher, regular presider at worship, and spiritual guide for Seekers Church since the mid-1980s. Deborah Sokolove is director of the Henry Luce III Center for the Arts and Religion at Wesley Theological Seminary, where she also serves as professor of art and worship. They are coauthors of Calling on God: Inclusive Christian Prayers for Three Years of Sundays (SkyLight Paths). Marjory Zoet Bankson, an artist and spiritual guide, is author of The Soulwork of Clay: A Hands-On Approach to Spirituality and Creative Aging: Rethinking Retirement and Non-Retirement in a Changing World (both SkyLight Paths) and former president of Faith At Work (now called Lumunos). Nancy L. Bieber is a Quaker spiritual director, retreat leader, psychologist, and teacher and author of Decision Making and Spiritual Discernment: The Sacred Art of Finding Your Way (SkyLight Paths). She teaches at Lancaster Theological Seminary and is a core leader with Oasis Ministries for Spiritual Development. Carolyn Jane Bohler is former professor of pastoral theology and counseling at United Theological Seminary in Dayton, Ohio, and author of God the What? What Metaphors for God Reveal about Our Beliefs in God (SkyLight Paths). Edith R. Brotman, PhD, RYT-500, an experienced educator and highly trained yoga teacher, is founder of Kavvanah/Mussar Yoga. She is author of Mussar Yoga: Blending an Ancient Jewish Spiritual Practice with Yoga to Transform Body and Soul (Jewish Lights). Michael J. Caduto is a renowned ecologist, educator, and storyteller, and author of Everyday Herbs in Spiritual Life: A Guide to Many Practices (SkyLight Paths). He is founder of Programs for Environmental Awareness and Cultural Exchange. Rev. Carolyne Call, an associate conference minister in the United Church of Christ, is author of Spiritually Healthy Divorce: Navigating Disruption with Insight and Hope (SkyLight Paths). She serves as a spiritual adviser for those in the process of divorce while also conducting workshops and retreats on spiritual, psychological, and moral development. Rev. Dr. Carole Ann Camp, founder of an ecumenical spiritual community called Seekers and Sojourners and a retired United Church of Christ pastor, has walked labyrinths on three continents. She is coauthor with Rev. Dr. Donna Schaper of Labyrinths from the Outside In: Walking to Spiritual Insight—A Beginner’s Guide (SkyLight Paths). Lynn L. Caruso is an inspiring educator, writer, and parent/child advocate and editor of the first-of-its-kind Blessing the Animals: Prayers and Ceremonies to Celebrate God’s Creatures, Wild and Tame (SkyLight Paths). Paul Wesley Chilcote, PhD, is an academic dean, a professor, and a Benedictine oblate at Mt. Angel Abbey in Oregon. He is author of The Imitation of Christ: Selections Annotated & Explained and John & Charles Wesley: Selections from Their Writings and Hymns—Annotated & Explained (both SkyLight Paths). Nancy Barrett Chickerneo, PhD, is director of SPA Sisters: Spirit, Place, and Authentic Self, a nonprofit organization whose mission is to awaken women to their true selves through interaction with nature, creative expression, and connection with other women. A licensed clinical professional counselor, Chickerneo is also author of Woman Spirit Awakening in Nature: Growing into the Fullness of Who You Are (SkyLight Paths). William Cleary was a Jesuit priest for over twenty years, a filmmaker, and a composer. He is author of many books on spirituality, including Prayers to an Evolutionary God (SkyLight Paths). His musical Chun Hyang Song was performed at the Seoul Olympics. Dr. Nancy Copeland-Payton, a pastor, hospital chaplain, and physician who practiced medicine for twenty years, leads retreats at church centers, monasteries, and with church groups to help people explore their experiences of loss. She is author of The Losses of Our Lives: The Sacred Gifts of Renewal in Everyday Loss (SkyLight Paths). Linda Douty, a leading speaker on the topics of meaningful aging, personal growth, and spiritual formation, is author of How Did I Get to Be 70 When I’m 35 Inside? Spiritual Surprises of Later Life (SkyLight Paths), a spiritual director, and a contributor to Presence (the journal of Spiritual Directors International). Marcia Ford is author of many books on spirituality, including The Sacred Art of Forgiveness: Forgiving Ourselves and Others Through God’s Grace and Finding Hope: Cultivating God’s Gift of a Hopeful Spirit (both SkyLight Paths). Monica Furlong was a British author, journalist, and activist; editor of Women Pray: Voices Through the Ages, from Many Faiths, Cultures and Traditions; and author of Zen Effects: The Life of Alan Watts (both SkyLight Paths). Caren Goldman is an award-winning journalist, spiritual retreat leader, and conflict-resolution consultant to churches, synagogues, and not-for-profit organizations. She is author of Restoring Life’s Missing Pieces: The Spiritual Power of Remembering and Reuniting with People, Places, Things and Self (SkyLight Paths). Rev. Steven Greenebaum, an Interfaith minister and founder of Living Interfaith Church in Lynnwood, Washington, is author of Practical Interfaith: How to Find Our Common Humanity as We Celebrate Diversity (SkyLight Paths). He speaks and leads workshops on Interfaith and compassion as the core of our diverse spiritual traditions throughout the United States and Canada. Kent Ira Groff, a spiritual companion for journeyers and leaders, retreat leader, and writer-poet, is founding mentor of Oasis Ministries in Pennsylvania. He is author of Honest to God Prayer: Spirituality as Awareness, Empowerment, Relinquishment and Paradox (SkyLight Paths). Imam Yusuf Hasan, BCC, was one of the first disaster spiritual care responders in New York after 9/11 and helped create a disaster chaplaincy response organization in New York City, within the American Red Cross. Rev. George Handzo, BCC, past president of the Association of American Chaplains, is vice president of pastoral care leadership and practice at the HealthCare Chaplaincy (HCC) in New York City. They are contributors to Disaster Spiritual Care: Practical Clergy Responses to Community, Regional and National Tragedy (SkyLight Paths). Ana Hernández, a composer, arranger, and performer of sacred music, is author of The Sacred Art of Chant: Preparing to Practice (SkyLight Paths). Cait Johnson, author of Earth, Water, Fire and Air: Essential Ways of Connecting to Spirit (SkyLight Paths), teaches workshops on connecting to Spirit, seasonal elemental approaches to self-healing, poetry writing, and conscious eating. Dr. Warren A. Kay, an avid runner, is associate professor and former chair of religious and theological studies at Merrimack College in North Andover, Massachusetts. He teaches a popular course called “The Spirituality of Running” and is author of Running—The Sacred Art: Preparing to Practice (SkyLight Paths). Karyn D. Kedar is senior rabbi at Congregation B’nai Jehoshua Beth Elohim in the Chicago area and the inspiring author of Our Dance with God: Finding Prayer, Perspective and Meaning in the Stories of Our Lives and God Whispers: Stories of the Soul, Lessons of the Heart (both Jewish Lights). Donald Kraus, executive editor for Bibles at Oxford University Press, has produced such high-profile projects as The Catholic Study Bible; The New Oxford Annotated Bible; and The Jewish Annotated New Testament. He is author of The Book of Job: Annotated & Explained (SkyLight Paths). Kay Lindahl teaches the sacred art of listening to a variety of groups all over the world. She is author of The Sacred Art of Listening: Forty Reflections for Cultivating a Spiritual Practice, cofounder of Women of Spirit and Faith, and founder of The Listening Center in Long Beach, California. Jay Marshall, PhD, a gifted teacher noted for his ability to express spiritual insights with compassion and grace, is dean of Earlham School of Religion, a Quaker minister, and author of Thanking & Blessing—The Sacred Art: Spiritual Vitality Through Gratefulness (SkyLight Paths). Margaret D. McGee, a writer, teacher, and leader of spiritual workshops and retreats, is author of Sacred Attention: A Spiritual Practice for Finding God in the Moment and Haiku—The Sacred Art: A Spiritual Practice in Three Lines (both SkyLight Paths). Ron Miller was chair of the religion department at Lake Forest College in Lake Forest, Illinois, where he taught for thirty years. He is author The Hidden Gospel of Matthew: Annotated & Explained and The Gospel of Thomas: A Guidebook for Spiritual Practice (both SkyLight Paths). Diane M. Millis, PhD, is an inspirational speaker, workshop and retreat leader, organizational consultant, and spiritual director. She is author of Conversation—The Sacred Art: Practicing Presence in an Age of Distraction and Deepening Engagement: Essential Wisdom for Listening and Leading with Purpose, Meaning and Joy (both SkyLight Paths) and is founder of the Journey Conversations Project. Rev. Timothy J. Mooney, a Presbyterian minister, reatreat leader, visual artist, and spiritual director, is author of Like a Child: Restoring the Awe, Wonder, Joy and Resiliency of the Human Spirit (SkyLight Paths). A pastor for over twenty-five years, he currently leads Community of ONE, a worshipping community in the heart of urban Denver. Linda Novick leads painting and yoga retreats in the United States and abroad and is author of The Painting Path: Embodying Spiritual Discovery through Yoga, Brush and Color (SkyLight Paths). Christine Valters Paintner, PhD, Obl. OSB, a Benedictine oblate, is the online abbess of www.abbeyofthearts.com and frequently leads retreats and teaches on the wisdom of Benedictine, Celtic, and desert ways of praying. She is author of Lectio Divina—The Sacred Art: Transforming Words & Images into Heart-Centered Prayer (SkyLight Paths), among other books. Gordon Peerman is an Episcopal priest, psychotherapist, and teacher. He is author of Blessed Relief: What Christians Can Learn from Buddhists about Suffering (SkyLight Paths) and is an adjunct faculty member at Vanderbilt Divinity School. M. Basil Pennington, OCSO, was a monk for more than fifty years. He lived at St. Joseph’s Abbey in Spencer, Massachusetts, and was the author of many modern spiritual classics, including Finding Grace at the Center: The Beginning of Centering Prayer and Psalms: A Spiritual Commentary (both SkyLight Paths). Jan Phillips is an award-winning photographer, writer, and national workshop leader. She is cofounder of Syracuse Cultural Workers, a publisher of artwork that inspires justice, diversity, and global consciousness, and is author of Divining the Body: Reclaim the Holiness of Your Physical Self (SkyLight Paths). Imam Jamal Rahman, beloved teacher and retreat leader, is author of Spiritual Gems of Islam: Insights & Practices from the Qur’an, Hadith, Rumi & Muslim Teaching Stories to Enlighten the Heart & Mind and Sacred Laughter of the Sufis: Awakening the Soul with the Mulla’s Comic Teaching Stories & Other Islamic Wisdom (both SkyLight Paths), among other books. Marty Richards, MSW, LCSW, is a clinical social worker, an affiliate assistant professor at the University of Washington School of Social Work, and a popular speaker on the topics of chronic illness, Alzheimer’s disease, elder care, and spirituality and aging. She is author of Caresharing: A Reciprocal Approach to Caregiving and Care Receiving in the Complexities of Aging, Illness or Disability (SkyLight Paths). Cory Richardson-Lauve, an award-winning scrapbooker, designer, teacher, and artist, is author of The Scrapbooking Journey: A Hands-On Guide to Spiritual Discovery (SkyLight Paths). Rabbi Jack Riemer, a well-known author and speaker, is rabbi emeritus of Congregation Beth Tikvah (now Shaarei Kodesh) in Boca Raton, Florida. Dr. Nathaniel Stampfer served Spertus Institute for many years as dean, vice president for academic affairs, and professor of Jewish education. They are coeditors of Ethical Wills and How to Prepare Them: A Guide to Sharing Your Values from Generation to Generation (Jewish Lights). The Rev. Canon C. K. Robertson, PhD, is canon to the presiding bishop of The Episcopal Church, a noted scholar, and a distinguished visiting professor at the General Theological Seminary in New York City. He is author of The Book of Common Prayer: A Spiritual Treasure Chest—Selections Annotated & Explained (SkyLight Paths), among other books. Rev. Nanette Sawyer, teacher and spiritual counselor, is author of Hospitality—The Sacred Art: Discovering the Hidden Spiritual Power of Invitation and Welcome (SkyLight Paths) and a founding pastor of Grace Commons, an innovative Christian community in Chicago that holds hospitality as a core value. Rev. Dr. Donna Schaper is widely recognized as one of the most outstanding communicators in her generation of Protestant clergy. Senior minister at Judson Memorial Church in New York City, she is author of Sacred Speech: A Practical Guide for Keeping Spirit in Your Speech and coauthor of Labyrinths from the Outside In: Walking to Spiritual Insight—A Beginner’s Guide (both SkyLight Paths). Dannel I. Schwartz, spiritual leader of Temple Shir Shalom in West Bloomfield, Michigan, is author of Finding Joy: A Practical Spiritual Guide to Happiness (Jewish Lights) and many articles on religion and spirituality. Rami Shapiro, a renowned teacher of spirituality across faith traditions and a noted theologian, is the award-winning author of The Sacred Art of Lovingkindness: Preparing to Practice and Perennial Wisdom for the Spiritually Independent: Sacred Teachings—Annotated & Explained (both SkyLight Paths), among many other books. Jim Sharon, EdD, and Ruth Sharon, MS, are dedicated to helping people improve their well-being by seeing their lives as individuals and couples through the lens of their soul. Jim has worked as a licensed psychologist; Ruth has been a professional counselor—both serving in private practice and leading seminars and retreats for over four decades. They are coauthors of Secrets of a Soulful Marriage: Creating and Sustaining a Loving, Sacred Relationship (SkyLight Paths). Louise Silk is a spiritual teacher, integrated kabbalistic healer, and professional quilter. She is author of The Quilting Path: A Guide to Spiritual Discovery Through Fabric, Thread and Kabbalah (SkyLight Paths). Rev. Susan Sparks, the only female comedian in the country with a pulpit, is senior pastor of the historic Madison Avenue Baptist Church in New York City (the first woman pastor in its 160-year history). She is author of Laugh Your Way to Grace: Reclaiming the Spiritual Power of Humor (SkyLight Paths). Rabbi Elie Kaplan Spitz is a spiritual leader, scholar, author, and speaker to a wide range of audiences. He is author of Increasing Wholeness: Jewish Wisdom and Guided Meditations to Strengthen and Calm Body, Heart, Mind and Spirit (Jewish Lights) and rabbi of Congregation B’nai Israel in Tustin, California. Rev. Martha Spong is a United Church of Christ pastor and is director of RevGalBlogPals (revgalblogpals.org), a social media ministry making community for clergywomen across lines of denomination, generation, nation, and orientation since 2005. Spong is editor of There’s a Woman in the Pulpit: Christian Clergywomen Share Their Hard Days, Holy Moments and the Healing Power of Humor (SkyLight Paths). Molly Srode, a retired hospital chaplain and former Catholic nun, is author of Creating a Spiritual Retirement: A Guide to the Unseen Possibilities in Our Lives and coauthor of Keeping Spiritual Balance as We Grow Older: More than 65 Creative Ways to Use Purpose, Prayer, and the Power of Spirit to Build a Meaningful Retirement (both SkyLight Paths). Tom Stella is a hospice chaplain, retreat facilitator, former Catholic priest, and a cofounder and director of Soul Link, a nonprofit organization whose mission is to bring spiritual seekers together. He is also author of Finding God Beyond Religion: A Guide for Skeptics, Agnostics & Unorthodox Believers Inside & Outside the Church (SkyLight Paths). Lori Joan Swick, PhD, is a popular speaker and retreat leader specializing in women’s spirituality and religious, mystical, and mythological topics. She is an adjunct professor of religion, mythology, and philosophy at St. Edward’s University in Austin, Texas, and author of Dreaming—The Sacred Art: Incubating, Navigating and Interpreting Sacred Dreams for Spiritual and Personal Growth (SkyLight Paths). Rodney L. Taylor, PhD, the foremost American researcher of Confucius as a religious and spiritual figure, is author of Confucius, the Analects: The Path of the Sage—Selections Annotated & Explained (SkyLight Paths) and professor emeritus of religious studies at the University of Colorado at Boulder. Terry Taylor is a workshop leader and frequent commentator for public radio and other media on topics related to spirituality, peace, and justice. He is executive director of Interfaith Paths to Peace, an organization dedicated to fostering interreligious dialogue, and author of A Spirituality for Brokenness: Discovering Your Deepest Self in Difficult Times (SkyLight Paths). Rev. Jane E. Vennard, a popular teacher on prayer and spiritual practice, is ordained in the United Church of Christ to a ministry of teaching and spiritual direction. She is author of Fully Awake and Truly Alive: Spiritual Practices to Nurture Your Soul and Teaching—The Sacred Art: The Joy of Opening Minds and Hearts (both SkyLight Paths). Cynthia Winton-Henry teaches people to unlock the wisdom of the body through movement and creativity. She is author of Dance—The Sacred Art: The Joy of Movement as a Spiritual Practice (SkyLight Paths) and is cofounder of InterPlay, an international not-for-profit organization with locations in over fifty cities on five continents. Andi Young is a member of the Kwan Um School of Zen (founding teacher Zen Master Seung Sahn) and author of The Sacred Art of Bowing: Preparing to Practice (SkyLight Paths).